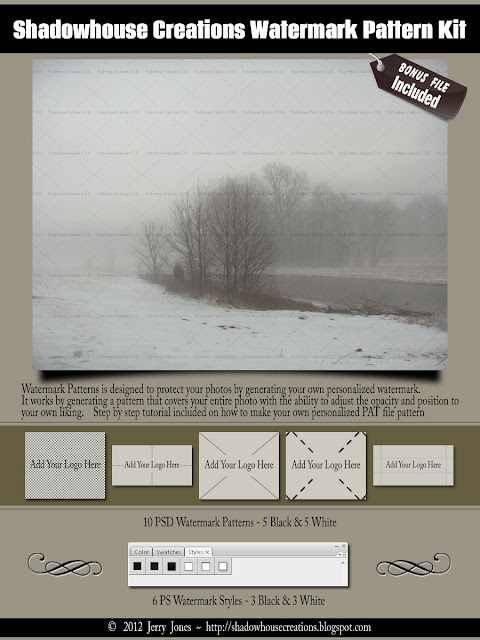 photo with the ability to adjust the opacity and position to your own liking. not so, being it covers your entire photo. plus turn them into photoshop "PAT" pattern files. Also 6 photoshop ASL styles, 3 dark and 3 light to add an extra effect to the patterns. and newer versions of photoshop, including CS6 and PS Elements. What a generous gift Jerry. Thank you. This is very generous of you, and will be very helpful. Thank-you! Thanks Ann, I appreciate it and I'll post to let others know. Care to divulge what version of Elements you used? Thank you so much for this post. I want to let you know that I posted a link to your blog in CBH Digital Scrapbooking Freebies (please, notice the new url for my blog), under the Page 1 post on May. 19, 2012. Thanks again. thank you seems such small words for the sharing you do for us all. Hi I got here by way of a fan of yours in Flickr - can you tell me if I can use your files for watermarks in Gimp?